Who are we? The Cotton Print Factory Shop! Arguably the largest stockists of fabric in the United Kingdom. 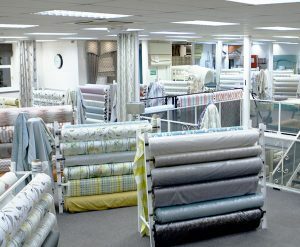 Curtain Fabric, Craft and Haberdashery, Vinyl and Table Covering, Cushions, Tie-Backs, Trims… the list goes on! Basically, we provide you with the stunning goods to complete that fabulous new Lounge, recover those old camper van cushions, design the party dress that is truly your own, or simply add finishing touches to your latest project. Whatever you are creating, we are here to help. Not only do we offer a huge selection to choose from but we offer it with the confidence that you won’t find it cheaper anywhere else. That’s right & if you do happen to find it cheaper elsewhere, we won’t just match it, we will beat it! Our Glasgow store opened in 1989 in Kinning Park. Situated just off the M8, Junction 21. 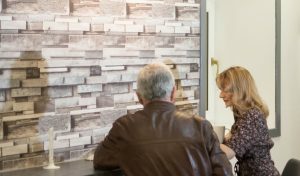 We offer customers free parking in our indoor car park. The closest subway stations are Shields Road or Kinning Park, both 5 minutes walk. There are also frequent buses that run along Paisley Road West, get off at the Paisley Road Toll that is at the bottom of our street. Our staff are fully trained and happy to assist you with any measurements (if you want to try it yourself, check out our fabric calculator on this webpage! ), supplying you with the bits & bobs that you need for your specific project or simply lend another pair of eyes to help you complete the look you desire. We have the friendliest bunch who are truly passionate about what they do, so in other words don’t be shy in asking for help! You can also grab a complementary tea or coffee from our Rosie – we know all that fabric choice can send you into excitement overload! We are passionate about offering the best of customer service and we love it when our customers share their finished projects. You only have to read some of our blogs or scroll through our Instagram to see what has been created! Have you met CP Bear yet? If you yourself have recently made something from Cotton Print fabric, please do send us in any pictures so we can post it to our news feed! The Cotton Print wouldn’t be what it is today without you wonderful Customers, so on that note we would like to say a massive Thank you & a very Merry Christmas and a Happy New Year!